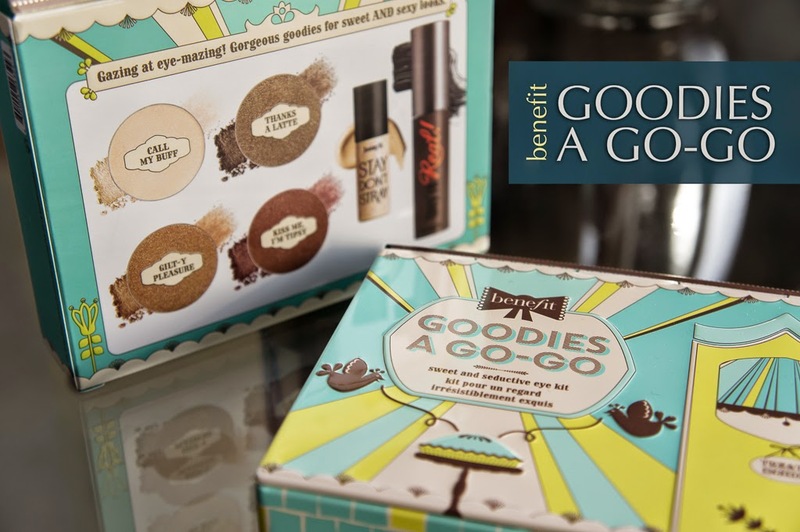 Benefit Goodies a Go Go was one of the prizes I received. Unfortunately this was a holiday set that is now sold out everywhere. But I decided to do a review on it anyway, and give you my opinion on the individual items that you can still purchase separately. Let's start with the Eyeshadows. I love the shades in this set, as they are neutral and very wearable but I have to say I'm not hugely impressed with the pigmentation. I expected better quality considering this is a high end product. Having said that, the fact the shadows are not so pigmented is not necessarily a bad thing, as they're a good option for days when I want a subtle eye makeup (i.e. for work). Also really nice for people in school (if they can wear any makeup) and also good for those starting to learn how to apply eyeshadow, as it's pretty fool proof. I haven't experienced any fall out with these but I do wear them with primer underneath. 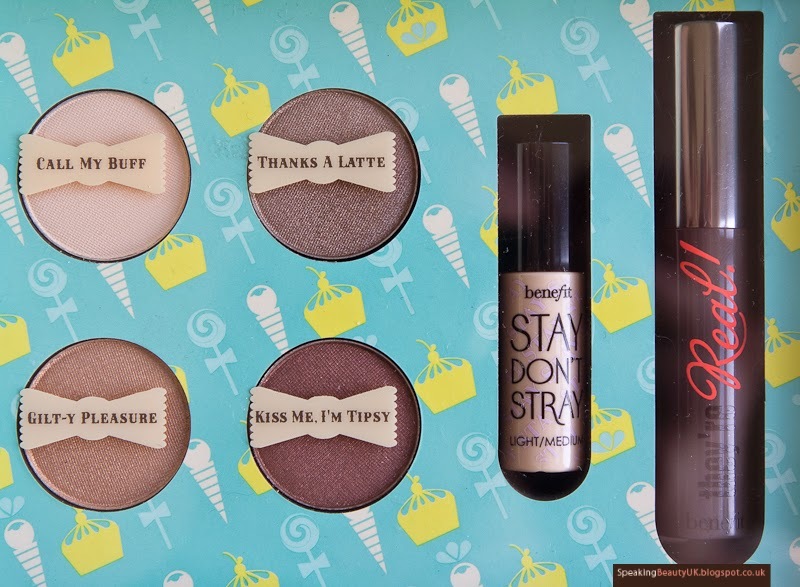 The 2nd item in this set is the Benefit Stay Don't Stray Primer and Concealer. 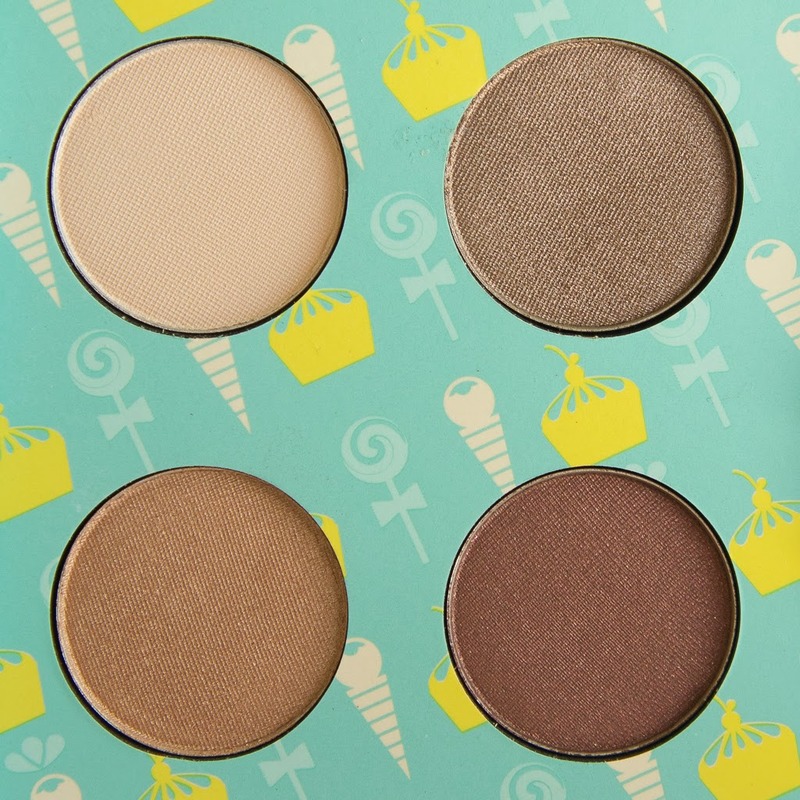 I was quite excited to try this product due to the claims that it'd work on both lid and under eye area to prevent eyeshadows and concealers from creasing. 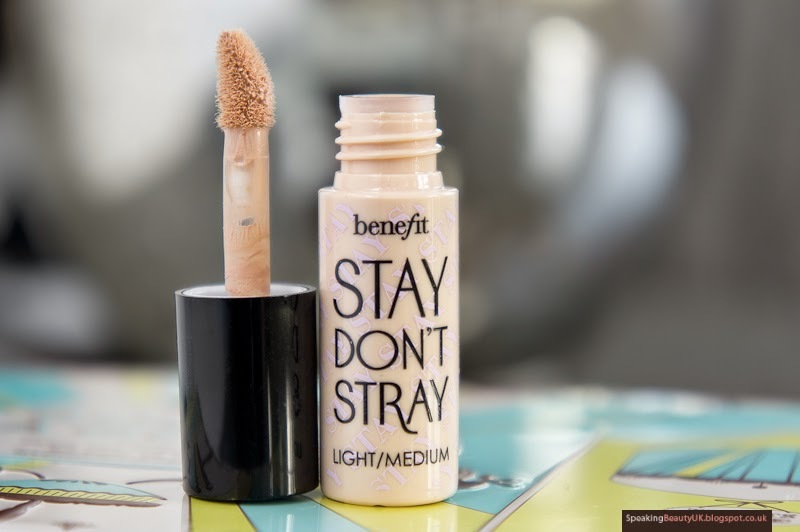 It's liquid in texture, comes with a doe foot applicator and is lightly coloured, meaning it gives off the same effect on the lid as a concealer would. It masks the veins and darkness on the lid, while keeping eyeshadows in place. Unfortunately I have oily lids so this wasn't quite enough to stop my shadows from creasing after about 4h (if not less). I also found it made my concealer look cakey and heavy when worn under the eyes. In other words, it didn't quite work for me, but if you don't have oily lids, this might be a good option for you. Also, if dark circles are not an issue (not my case), you could probably get away with wearing only this under the eyes. I, however, will stick to my Mac Paintpots. 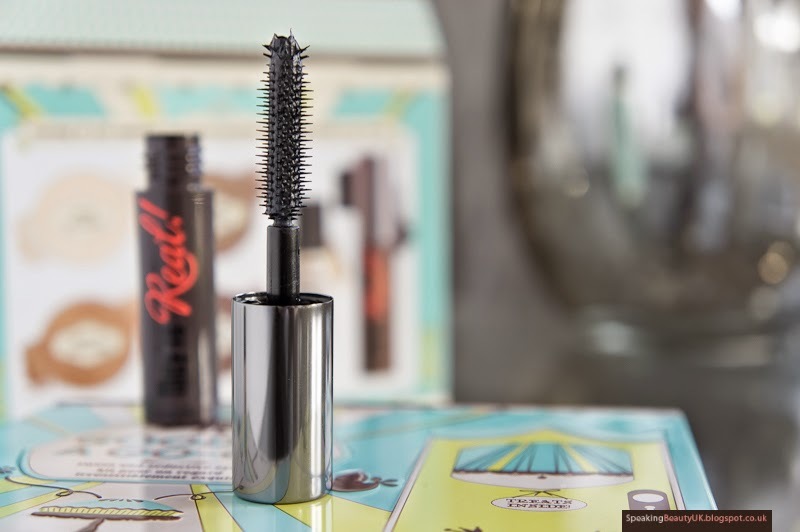 Lastly, the ever so popular Benefit They're Real Mascara. 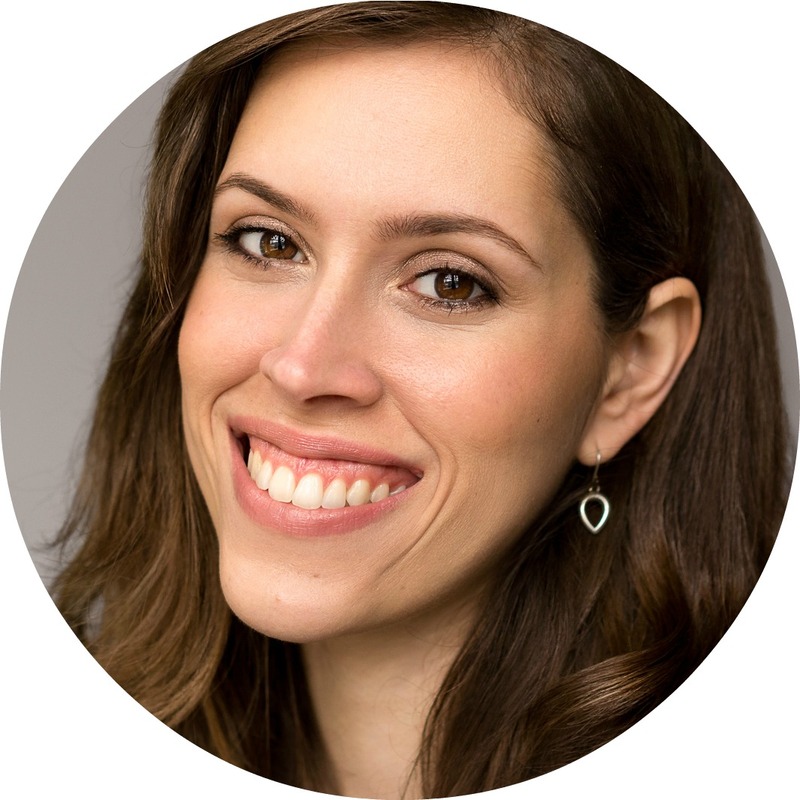 This mascara promises to add length, curl, volume and separate the lashes. In my opinion it does add length but not so much volume and I definitely need to use my eyelash curlers to have a curl with this (as with most mascaras, to be fair). It's got a plastic wand with a round edge, to help apply the mascara to the corner of the lashes. While I like the formula, I find the 'bristles' a bit sharp and I always seem to poke myself with the wand. Is it just me? Some people complain this mascara is very difficult to remove but I don't have many problems with it. I just use an eye makeup remover first and then I go in with my normal cleanser and it's pretty much gone, without much rubbing. The problem I find with this product is that once the formula dries it becomes very clumpy, which I personally don't like. Would I buy the full size? No! I think there are other better mascaras out there. If you want to try a Benefit mascara, I'd recommend going for the new Roller Lash (read my review here). Much better in my opinion.